You have to admit that the moniker “Baby Beemer” is rather patronising. With a nickname like that, you’d expect all of the 2017 BMW 1-Series Petrol offerings to be cutesy as well as little. Bug-eyed, perhaps. Well, the 2017 BMW 1-Series Petrol models are the smallest from the German manufacturer’s stables and they do have round twin LED headlights, but bug-eyed and cute it is not. This doesn’t mean that the 2017 BMW 1-Series Petrol models are ugly. On the contrary. Like most BMWs, they are aesthetically pleasing and well proportioned. In fact, you have to see the 2017 BMW 1-Series Petrol hatchbacks in context to get an idea of their scale and size, as their lines and profiles don’t give away that this is a small vehicle. In many ways, a test drive is a must so you can really see if the 2017 BMW 1-Series Petrol is the right size for you – which it could well be. No matter which of the four 2017 BMW 1-Series Petrol models you prefer, there’s some things that you’ll get in all of them. In all of them, you’ll get navigation as standard (6.5-inch display), Bluetooth connectivity, BMW’s Driving Assistant package (this includes approach control waning, lane departure warning, pedestrian warning, light city braking function and pedestrian warning) and the full thing in the stability control department (ABS braking, traction control, cornering braking control and braking assistance). A rear view camera and park distance control at the rear also come as standard. Although it’s a five-door hatchback, there is seating for five inside and a surprising amount of storage space for a smaller vehicle, with sports seats for the driver and front passenger (and a leather-wrapped sports steering wheel with contrasting red stitching). A lot of people on the lookout for a five-door hatchback are interested in fuel economy, and these buyers will be looking at the entry-level 118i model of 2017 BMW 1-Series Petrol. This is powered by a tiny 1.5-L engine that (under test conditions) manages to wring out 5.2 L/100 km), and has an 8-speed steptronic automatic transmission. Despite being frugal, this engine is no slouch as it has a maximum power output of 100 kW and the torque peaks at 220 Nm – not bad! of course, this will depend on how you set the driving mode: ECO Pro or Sport Plus? To get similar fuel economy (5.9 L/100 km) but with a few extras such as fog lights, park distance control at the front as well and 17-inch wheels instead of 16-inchers, then you’re likely to prefer the next 2017 BMW 1-Series Petrol in the line, the 120i. The engine here is a tad bigger, being a 2-L four-cylinder job that puts out 135 kW of power and a respectable 270 Nm of torque. Five-door hatchbacks appeal to a wide range of drivers, and there are some of you who are wondering if the 2017 BMW 1-Series Petrol lineup includes some hot hatches or sports hatches. 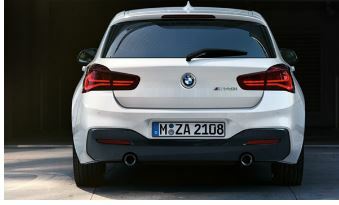 Well, would the 125i with the M Sport package and the M140i do for you? The 125i is pretty feisty, the 2-L engine putting out 165 kW of power and 310 Nm of torque to get a 6.1-second 0–100 km/h time. It’s also got some nice wee extras in the form of blue brake callipers and M Sport suspension for that extra edge when handling. It’s got variable sports steering and the 8-speed automatic transmission’s got paddle shifters for you to play with. The navigation system goes up a notch not only in the size of the screen (8.8 inches) but also in the amount of data storage and the ability to read data DVDs. Of course, the pinnacle of the 2017 BMW 1-Series Petrol line is the M140i sports hatchback. It’s not in your face, with only the M badging to give away that this is a force to be reckoned with. The engine is a turbo aspirated 3-L inline six that can put larger vehicles to shame. While the power figure may look only just on the higher side of average (250 kW) the torque and the 0–100 time are not, being 500 Nm and 4.6 seconds respectively. You probably don’t want to use this hatchback for towing… but it’s got the twist to do a bit of it if you absolutely have to. One thing’s for certain, no matter which of the 2017 BMW 1-Series Petrol models you prefer: the littlest hatchback in the BMW lineup has got a big heart! For any more information on the 2017 BMW 1-Series Petrol, or for that matter any other new car, contact one of our friendly consultants on 1300 303 181. If you’d like some fleet discount pricing (yes even for private buyers! ), we can submit vehicle quotes requests out to our national network of BMW dealers and come back with pricing within 24 hours. Private Fleet – car buying made easy!